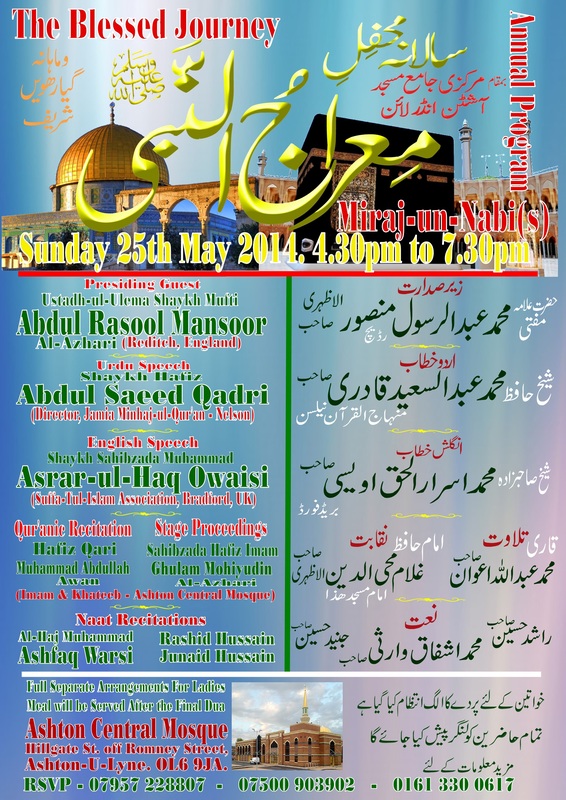 The Ashton Central Mosque is proud to present the annual programme of Al-Isra Wal Mir’aj. The blessed journey and ascension of the noble Prophet Salla Allahu ‘Alayhi Wa Sallama to the farthest place in creation and beyond to meet and directly converse with Allah Subhanahu Wa Ta ‘Ala. This significant night is of paramount importance to all Muslims throughout the world in the sacred month of Rajab, and we invite all brothers and sisters to join us to retrace the blessed journey of the noble Prophet Muhammad Salla Allahu ‘Alayhi Wa Sallama. A high calibre of leading Urdu and English scholars have been invited to authentically inform you of the importance of this journey and its relevance in our daily lives. Food will also be served. For further information or participation, please contact the management at Ashton Central Mosque.